Do you remember “Schoolhouse Rock” and the catchy teaching moments imparted on kids who were learning valuable lessons between the cartoons they were watching? One of the snippets I remember is “conjunction junction, what’s your function?” The tune and examples used to make the lesson fun have stuck with me over the years. Unfortunately, there are no happy songs that go with serious or deadly injuries caused by distracted driving. According to the Florida Highway Patrol, in 2017, there were 3,069 incapacitating injuries and 220 deaths attributable to distracted driving. So, what is distracted driving? Distracted driving is anything that takes your hands off the wheel, your eyes off the road or your mind off driving. It is extremely risky behavior that puts everyone on the road in danger. This means your distraction action of lowering the vanity-visor in your car to apply or check make-up while driving is distraction; reaching back to try and give the baby a bottle in the back seat is a distraction; likewise shaving, reading, texting and yes even talking on your cell phone, are all forms of distracted driving. The good news is every distraction action can be controlled by the driver and eliminated. Not to mention, that every time you look away from the road is like driving with your eyes closed. If a text or call is that important, safely pull over and take care of the issue. Being upset and distracted can be a disaster waiting to happen, but even happy texts and calls can be deadly. According the Center for Disease Control, every day in the US approximately nine people are killed and more than 1,000 are injured in crashes involving a distracted driver. Teens to age 20 have the highest proportion of distracted driving fatal accidents. The report finds that this age group is also more likely to participate in other “risky” behavior such as driving without wearing a seatbelt and drinking and driving. To be sure, youthful drivers may be more prone to risky distracted behavior, but the issue of distracted driving is everyone’s problem. There are things we can do to consciously help us change our modus operandi. Have you downloaded one of the many apps that blocks calls and text messages while you are driving, but allows you family members to get through? Are your car charger and cord already plugged into where they need to be in case you need them? Is your music set to the mode you would like for the entire trip? Is your coffee secure in the cupholder? And how’s that make-up, or tie? This is an exercise worth going through until you can remove every barrier that keeps you from paying attention to your driving. If we recognize our “distraction action” we can change our behavior and help save lives. To date, the Terrell Hogan Distracted Driving Awareness Campaign has reached more than 8,847 teens and adults on the First Coast through its presentations. Contact our office for a complimentary Distracted Driving safety presentation for your club, organization or at your job. We can all be a part of the solution to end the danger of distracted driving. To schedule a free presentation call (904) 722‑2228. 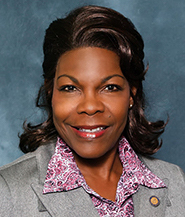 Audrey Gibson is a Florida State Senator and Paralegal with Terrell Hogan Law Firm.